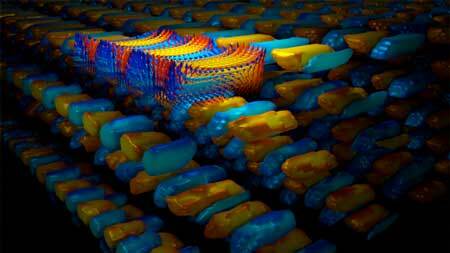 (Nanowerk News) 'Frustration' plus a pulse of laser light resulted in a stable “supercrystal” created by a team of researchers led by Penn State and Argonne National Laboratory, together with University of California, Berkeley, and two other national labs. This is one of the first examples of a new state of matter with long-term stability transfigured by the energy from a sub-pico-second laser pulse. The team’s goal, supported by the Department of Energy, is to discover interesting states of matter with unusual properties that don’t exist in equilibrium in nature. Gopalan compares this challenge to sending a ball rolling down a mountain side. It will not come to rest until it reaches the bottom of the mountain, unless something gets in its way, say a ledge. The team accomplished this by “frustrating the system” — or not allowing the material to do what it wants to do, which is to allow it to minimize its energy fully without constraints. The researchers did this by using single atomic layers of two materials, called lead titanate and strontium titanate, stacked in alternating layers on top of each other to build up a three-dimensional structure. Lead titanate is a ferroelectric, a polar material that has electrical polarization that leads to positive and negative electric poles in the material. Strontium titanate is not a ferroelectric material. This mismatch forced the electric polarization vectors to take an unnatural path, curving back on themselves to make vortices, like water swirling down a drain. The Berkeley team grew these layers on top of a crystal substrate whose crystals were intermediate in size between the two layered materials. This provided a second level of frustration, as the strontium titanate layer tried to stretch to conform with the crystal structure of the substrate, and the lead titanate had to compress to conform to it. This put the whole system into a delicate but “frustrated” state with multiple phases randomly distributed in the volume. At this point, the researchers zapped the material with a laser pulse, which dumps free charges into the material, adding extra electrical energy to the system. This drives it into a new state of matter, a supercrystal. These supercrystals have a unit cell — the simplest repeating unit in a crystal — much larger than any ordinary inorganic crystal, with a volume one million times larger than the unit cells of the original two materials. The material finds this state on its own. Unlike transient states, this supercrystal state stays around forever at room temperature — at least a year in this study — unless it is heated to about 350 degrees Farenheit where it is erased. The process can be repeated by hitting the material with a light pulse and erased using heat. This state can only be created by ultrashort laser pulses with a certain minimum amount of threshold energy, and not by spreading out that energy over long pulses. A supercrystal, designed to uncover hidden phases of matter, is frozen permanently into a new structure by an ultrafast laser pulse. Vlad Stoica, a post-doctoral scholar shared jointly between Penn State and Argonne National Laboratory and lead author, used high energy x-ray diffraction to examine the supercrystal before and after it forms, clearly showing the transformation from disordered matter into a supercrystal. The results were reported in Nature Materials ("Optical creation of a supercrystal with three-dimensional nanoscale periodicity"). High-resolution X-ray diffraction combined with imaging at the nanoscale was used by the Argonne researchers to observe the evolution of irreversible structural reordering. Long-Qing Chen’s theory group at Penn State performed computer calculations using a phase-field software package, mu-PRO, that closely simulated the experimental results. “It’s quite remarkable that our phase-field simulations were able to predict the three-dimensional real space images of a supercrystal whose diffraction patterns generally match the experimental patterns, and to identify a range of thermodynamic conditions for the stability of the supercrystal. Such an integrated experimental and computational studies are extremely useful and productive,” Chen says.